Salt Lake Bees • Pitcher allows just one hit over 52⁄3 innings. Nine straight runs provided more than enough cushion for the Salt Lake Bees pitching staff as they grabbed a 9-1 win over the Omaha Storm Chasers in front of an announced crowd of 14,366 — mostly elementary school students — in the final game of a four-game series on Kids Day at Smith's Ballpark on Tuesday. Bees hitters Nolan Fontana (2 for 3) and Eric Young Jr. (3 for 5, three RBIs) each hit two-run home runs, while Shane Robinson and Tony Sanchez had two hits apiece. The Bees scored in the second fourth, fifth and sixth innings, including a three-run fourth inning that saw seven players bat. TURNING POINT • The Bees were already up two runs when they tacked on three in the fourth on an error and four singles, including three bunt singles. The first three batters of the inning reached base without the ball being hit out of the infield. Bo Way, Sanchez and Eric Young Jr. each collected an RBI in the inning. BEES' MVP • Fontana homered, reached base three times and scored three runs. He also stole home as part of a double steal in the second inning. HIDDEN HERO • Pitcher Nate Smith made his first start of the season and allowed just one hit in 52⁄3 innings. He struck out four and didn't issue a single walk. He threw just 67 pitches (47 strikes). Smith had been in extended spring training rehabbing a muscle strain in his forearm that he sustained at the end of last season. QUOTEWORTHY • "It was exciting," Smith said of his start. "It was good to get out of Arizona, out of rehab and come back and join the team. Obviously with a bunch of kids out there, you try to just zone them out because they're going to be asking for bats and balls and stuff. That's part of it, but it was fun. It was a good win, and it's nice to have an off-day tomorrow." ANGEL ANGLE • Angels infielder C.J. Cron did not play on Tuesday morning. He remains on the Salt Lake Bees roster on a rehab assignment, but the former University of Utah standout got removed from Monday's game after being hit by a pitch. HISTORY LESSON • Tuesday was the 15th Kids Day hosted by the Bees. They've won five of the past six kids day games in Salt Lake City, including back-to-back victories. Tuesday's win also pushed their record to 6-5 in the past 11 kids day games at home. NEXT • The Bees will have a day off Wednesday before starting a series against Iowa on Thursday night at 6:35 in Smith's Ballpark. 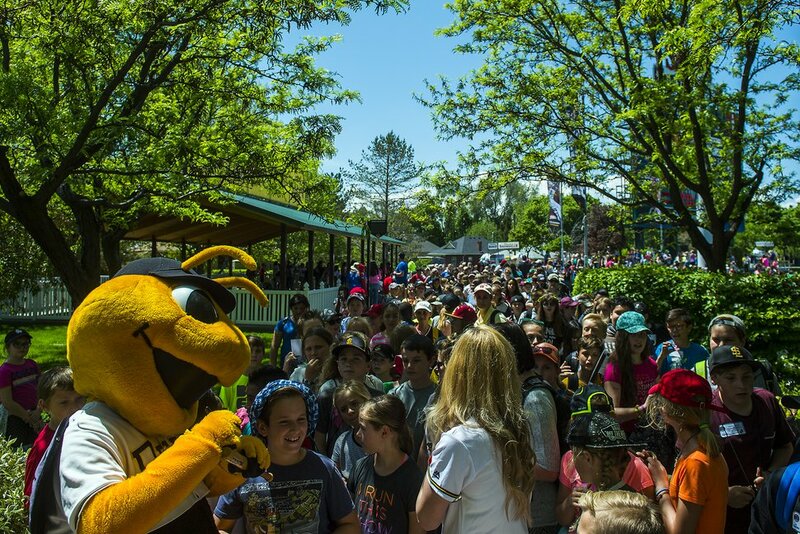 Chris Detrick | The Salt Lake Tribune Bumble the Bee signs autographs for children while the Salt Lake Bees play the Omaha Storm Chaser during the annual Kids Day game at Smith's Ballpark Tuesday, May 9, 2017.